It’s not just for millennials! Kale is hardy, easy to grow, and rich in nutrients, making it an increasingly popular addition to salads, smoothies, and other healthy dishes. Dark-leaved Lacinato kale is also commonly known as Tuscan kale, Tuscan cabbage, Italian kale, and Dinosaur kale. The last appellation relates to its puckered leaves that look like they might resemble dinosaur skin. Long a staple of Italian cooking, bittersweet Lacinato kale may have been favored over other varieties because its relatively thin leaves make it easier to prepare—almost like spinach. Kale—Brassica oleracea var. Sabellica—is a member of the Brassica or cole crop/cabbage family. In addition to cabbage, other members of this family include broccoli, Brussel sprouts, collard greens, and cauliflower, to name a few. Considered ‘superfoods’ by some nutritionists, brassicas are rich in a number of important vitamins, minerals and other nutrients with cancer fighting and cholesterol-lowering properties. Kale has been around for a long time. It was one of the most common green vegetables in Europe through the end of the Middle Ages, when a ‘mutated’ variety grown into ‘heads’ also became popular: what we now know as cabbage. Fast forward to today when multiple varieties of kale are grown and enjoyed worldwide and are a common fixture at farmers’ markets across the country. Ideally full sun but it can tolerate part shade. Part shade is helpful in hot climates. The soil should be kept evenly moist but not soaked. Freshly-planted seeds and newly established plants should receive a gentle, regular—but not soaking—watering. Be careful not to splash soil onto the leaves. Kale likes moist, rich, well-drained soil. Soil pH should be 6.5–6.8. Kale seeds can germinate at soil temperatures 40 degrees and above. Kale seeds will germinate in air temperatures between 45 and 85 F; around 65 degrees would be best. Once established, kale can tolerate subfreezing temperatures. Plants will not thrive in temperatures above 80 degrees. In northern climates, start kale seeds indoors about 4-8 weeks before your last anticipated spring frost; transplant seedlings outdoors once true leaves have appeared. Those in more moderate climates can direct seed in early spring or in early fall for a late fall harvest. Plant seeds 1/2 inch deep, 3 inches apart and then thin plants to 12 inches apart when they’re 4-5 inches tall. Outdoor rows should be spaced 12-18 inches apart. Seeding to maturity generally takes 45-60 days. Add rich compost or organic fertilizer at planting time and again every six weeks. Kale thrives in cold weather and can become overly-bitter when maturing in the heat. Good companions include: beets, cucumbers, dill, lettuce, mint, nasturtium, onions, spinach, and chard. Yes! Multiple, compact plants can fit in a large container. Container planting has the advantage of the plants being able to be moved around to cooler locations as summer progresses. While you can harvest young kale leaves, it’s best if you wait until the plant matures and they’re at least 10 inches long—around two months after planting the seeds. You can continually harvest the leaves thereafter, selecting the older, outer leaves, leaving the central part of the plant to continue to grow. 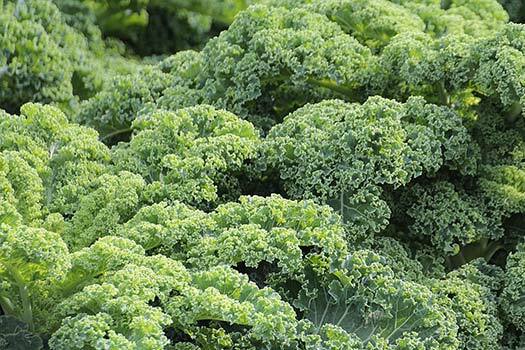 Kale is a hardy, cool season delight that’s easy to grow. An heirloom variety, it was propelled into pop culture by a couple of health-conscious Hollywood icons and quickly attained cult status among Millennials. It grows best in early spring and fall and can tolerate light frosts. In USDA zones 7-9, it can generally be grown year round if winters are mild. Kale leaves are sweeter and less bitter when grown in cool temperatures. The plants are prized for their varied, ornamental foliage as well as their flavor and nutrition. Low calorie and high in fiber, kale is packed with a number of important nutrients, especially Vitamins A, C, and K.